Knitting moose loves to knit gifts for all her woodland friends! 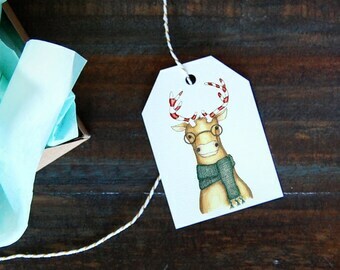 She is a woodland gift tag suitable for many occasions. Use as a holiday gift tag, use on your handmade knitwear packaging, or print a set and gift to a knitter or moose fan. I painted this moose in watercolor and outlined him in black ink. He would make a fun addition to all of your knitwear gifts. 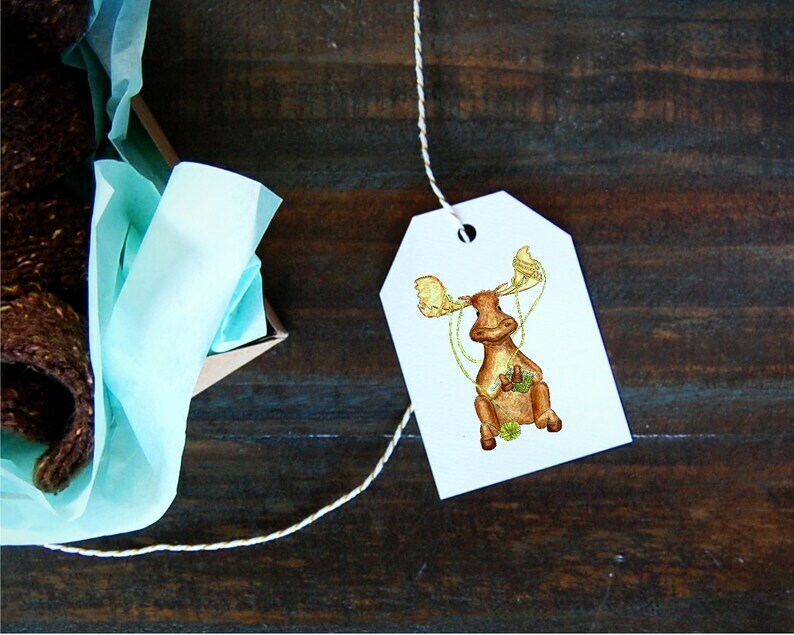 Get creative and string a few up for bunting, cut out and use for paper crafts, or print a few and package them up for an instant DIY gift! 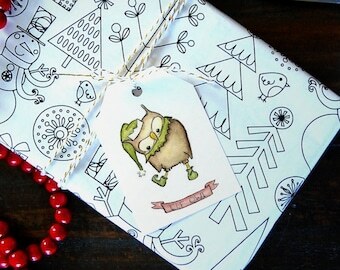 He is an instant download gift label so you can enjoy right away! FOR PERSONAL USE ONLY OR MAY BE PRINTED AND USED FOR HOLIDAY PACKAGING FOR YOUR OWN SMALL BUSINESS PRODUCTS. • Download to your computer and print as many as you need (for personal use only-small business packaging use acceptable-only printed and used as packaging, may not resell)! Please enjoy and print as many copies as needed for your personal project. All artwork in my design layouts is original and protected by copyright law. These files are for personal use only! Using any of these images in your own designs, reselling them as is, in any altered form, or displaying in anyway that results in collecting money is prohibited. Please be kind and respect the hours of love, sweat and tears that go into creating the original art that went into this design.